The Construction of an Interpretation Centre at Acinipo has been delayed by the Ministry of Works of the Junta de Andalucia on the grounds that the proposed location sits on underveloped land zoned for comprehensive protection. 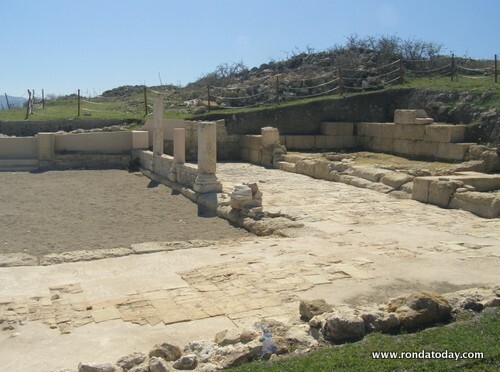 In the last year the Ronda Council and the Ministry of Culture have been working together to develop and excavate the ruined Roman city of Acinipo for the enjoyment of visitors and future generations. The most recent delay affects the construction of a museum and cafe/restaurant, shop, audio visual room, and education room for groups such as schools. Under plans submitted to the Junta for approval the interpretation centre is to be built within the city boundaries, and would incorporate the foundations of a Roman villa under the museum so that this could be glassed over as a permanent exhibit. The delay is caused by concerns that the building’s construction would unnecessarily endanger archeological heritage. The group Ecologists in Action have called for the interpretation centre to be constructed on farmland outside the Acinipo boundaries, and have welcomed the decision of the Junta to have Acinipo registered in the general catalog of historical heritage. Acinipo is widely considered to be amongst the best preserved Roman archeological sites in Spain, primarily due to it being covered over for hundreds of years. Whilst most of the structures are these days only foundations, it is possible to map the streets and most buildings, and the partnership between Ronda’s archeologists working from the Palacio Mondragon and the Ministry of Culture have unearthed and are now preserving the Roman baths. The interpretation centre is seen as an essential part of promoting and protecting Acinipo’s heritage.